This site is dedicated to the life and published writings of Isabella Alden. Here you can read more about Isabella, find links to her books, read short stories, and enjoy some facts and trivia about Isabella and the world in which she lived. Whether you’re a new reader of Isabella’s books or a long-time fan, you’re sure to find something of interest here. Enjoy your stay! Click on the image to visit Isabella’s blog. Thank for for converting these wonderful books into kindle format and also free pdf’s. I just recently discovered them on Amazon and subsequently found your site. I really appreciate the lovely covers! I love Isabella Alden’s stories and have many of them either as ‘real’ books or kindle, but was delighted to find some in your collection that I couldn’t find before, it’s like finding a golden nugget! I also love Susan Warner, Agnes Giberne and Amy le Feuvre’s books. Isn’t our digital age great? We have instant access to so many wonderful old books! I’m glad you’re enjoying Isabella Alden’s books on Kindle. We’ll keep hunting for more of her books to post on this site and on Kindle. I am so enjoying your sit; thank you for the emails with the great articles, am enjoying those on Chautauqua lately, and I was grateful you sent me a notice when a book of Isabella’s had just come out in Kindle, “A Pocket Measure.” I got it right away and I love it! A wonderful site, thank you again!! Mary Anne, I’m so glad you enjoy the site! Thanks for the kind words. i am so grateful to discovered this author Isabella alden’s books. it is the grace of God. Amy, thank you for taking time to comment. I agree—Isabella’s books are a blessing! Thank you for providing me the blessing of reading more of my favorite inspiring much loved author. Karen, you are so welcome! Wonderful site! I appreciate your feature on Chautauqua and would like your permission to use several of your old photos/postcards for a publication on the ties between Americans and the Holy Land in the 19th century. Dear Jenny, Is there a sequel to The Hall in the Grove? I simply adored that book and would give worlds to know what became of both Paul and Caroline! I literally wept when the dainty, slightly dim-witted Aimee came into her own at kindergarten class; and loved the scenes set in the “Temple.” Cannot get enough of these Chautauqua books! Please, is there a sequel? Or are those characters featured in any other of Pansy’s wonderful books? Thanks so much and thanks a hundredfold for taking the time to maintain this site. I appreciate the work you put into it and am getting so much out of it! Blessings! Karen N, Rochester, NY (right down the road from Chautauqua!). Thanks, Jenny! I’m glad to hear I’m not the only one! And yes, I did love Mrs. Fenton too! Where do you do you’re looking when you are trying to hunt down new to you Isabella books? And, I am actively doing research on the Chautauqua season for next year, looking for a place to stay so that I can make a little pilgrimage to the many sites in Pansy’s books. I’ve discovered that some of the cottages there have some very pretty accommodations, and are not outrageously expensive! Naturally, they go fast. So I’m doing everything I can to get the research together so that I can make a recommendation to Pansy’s many friends. I totally agree. I sniffed romance when the characters were in the room together but wasn’t sure until Mr. Holden confessed all. Then the tears came! I just love Isabella’s heart for these sorts of interrupted love stories. Write it for us, won’t you? Hi! I’ve been a fan of Grace Livingston Hill since the late 60s when my mother gave me a book to read that I soon found would be a longtime favorite. I was around 10 or 12. Im now in my 60s, so don’t really remember if it was Phoebe Dean, The Best Man, or The Enchanted Barn. But, this last week, the story has taken an unexpected, and exciting turn. I was busy cleaning out some old family junk. It appeared to be box after box of paperwork and moldy junk. We did find some boxes of old pictures, and papers that looked like old contracts, deeds, and canceled checks. They seemed to be dating back to as early as the mid 1800’s. We didn’t really look through it other than to confirm that it didn’t look like any family that we recognized, but, just to be sure, we kept it to look at later. As we continued through the papers, we came across a bunch of deed type papers with the name G R Alden on them. Then a LOT of papers that were signed by Isabella M Alden. The pictures had handwritten notes on them, like “Frank Hill”, and “To my Auntie Bella”. I decided to google who Isabella Alden was, and to my surprise (but not YOURS, I’m sure!) I had stumbled onto a collection of personal papers from Grace Livingston Hill’s family! 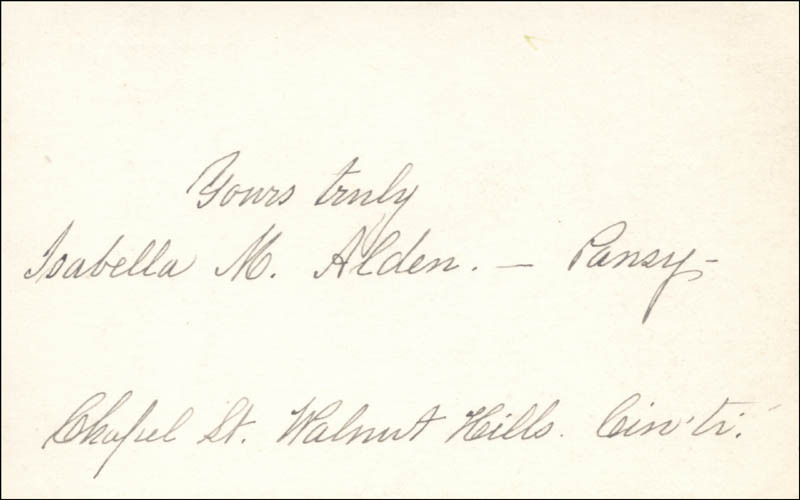 There were even handwritten letters from Raymond MacDonald Alden concerning their property in Chatuagua. I thought you might be interested in news of my discovery, so decided to write. I’ll also be sending this story to the Isabella Alden Website. How exciting!!! Wow, Dara, you’ve discovered a treasure box! I’m so excited for you (and a wee bit jealous)! Those photos and notes, deeds and contracts really can help tell the stories of the lives of Isabella and her family; and they’re all the more precious when they’re in their handwriting. They’re the kind of documents I’d LOVE to get my hands on! If you ever decide you want to share what you found with devoted fans of Isabella Alden and Grace Livingston Hill, I hope you’ll let me know. I’d be happy to get the word out if you decide to share them on social media. Also, you have an open invitation to share as many of the items as you like here on this blog. I know my blog readers would love to see them. Congratulations, Dara! And thank you for letting me know about your very exciting discovery! I notice that your Free Reads are books not available on Amazon.ca’s Kindle library for purchase. Is there an e-reader I can buy in Canada for accessing these free reads, rather than just reading them on a computer screen or tablet? Mary, your question couldn’t be more timely! One of our goals for 2018 is to make Free Reads available in other formats besides PDF. The process is going to take a little time, but we’re working on it. In the meantime, you can read the existing Free Reads on your Kindle by loading them into your Kindle library. The easiest way to do that is to connect your Kindle to your PC or Mac via USB; just drag the file or copy/paste it to your Kindle folder. Option 2 is to e-mail the PDF to your Kindle’s e-mail address. You can find your Kindle’s e-mail address on your Kindle’s Settings page; or you can log on to Amazon and select Manage My Kindle, where you’ll find the e-mail address listed. I hope this helps in the short-term. I’ll keep you posted on our progress in publishing Free Reads in additional formats. Thanks, Mary! Thank you so much for your response to my question. Option 2 worked for me. I never knew I could add other files [i.e., pdf] to my basic Kindle before; I thought I might have to buy a more advanced version or a tablet, or some other wireless device for it to work when not attached to my desktop computer. Also, I haven’t checked if the very small print can be enlarged, but if not, I will have some use for my 3.25 glasses other than just sewing! As far as my interest in Isabella Alden’s books goes, I want to add to my library and read every book she has ever written [I have the 20 numbered paperback and some other printed editions, and all those available from Amazon.ca and your site in e-book or pdf format — just as I have in my have in my library [in printed copy] and have read [twice — and “Marcia Schuyler” several times] all 100 numbered paperback editions of Grace Livingston Hill’s books (and The Grace Livingston Hill Story) and any new ones offered in Kindle, as well as all six of Ruth Livingston Hill’s printed books. I have been a frequent visitor to the Grace Livingston Hill and Isabella Alden sites to read everything I can about these two wonderful authors and their lives. At one time I even looked up on Google the street address and house where Grace Livingston Hill lived and wished I could go and see it in person. I am so glad there are other people who are still interested in these books. I have no interest in modern romance novels [any written later than the books I read in my church library during my years in high school], and I very much avoid any books that have been “revised and updated for modern readers” (i.e., tampered with). I am thankful to God and to you and others who are not allowing these books to fade into history. I find them inspiring and just as relevant to Christian witness and experience as when they were written. I have been so intrigued by the concept of boarding houses so common in Pansy’s books that I have gotten into starting one myself. Just like in the 1800’s, there are many people who cannot afford a house or apartment or are working in a place short term. So I have gotten into renting rooms. Much of the interesting material in her books comes from the mix of characters thrown together who would have never met otherwise, except for being in the same boarding house. I hope you will cover boarding houses and the role they played in an upcoming blog entry. I’ve been searching for the complete Chautauqua series in paperback – and can find only a few titles here and there. Is there no money to be made printing paperbacks anymore? Is the audience just too small? How will we read books when an EMP wipes out the power grid (and even electronics)? Most of the used copies I’ve located were published by the GLH LIbrary (Grace Livingston Hill). Print On Demand B&W paperbacks sell for about $10 – twice the typical $5 cost of a traditional print run. But, they are printed one at a time! The last I checked, the setup cost for one POD title was $400. Maybe GLH Library could be persuaded to offer their Isabella Alden titles again via POD? I have no idea if the typesetting and cover designs for GLH library are convertible to what POD machines require. The typical setup has you submit a PDF. Divide and conquer: if someone provided PDF files ready to submit to POD providers, then other people could pay for small POD runs. Still others could provide a way to get people together for a print run. Any or none of these steps could be paid. If I am floating $1000 for a POD run, it would be reasonable to pay $50 for a ready to go PDF. Thanks for the suggestion, Stuart. We’ll have an update for you soon! Those titles not picked up by GLH library seem to be where Print on Demand can do the most good – maybe even make a profit, Pansy style! PoD copies will have to sell for $10-$12 for a 50% gross margin. That cannot compete with the GLH titles – BUT, that is half the cost of the $20-$30 older editions. An example is Mag and Margaret, which is a stand alone title. This is the market to aim for. Great info, Stuart! Your research tracks with ours. We’ve been publishing paperback editions of Isabella’s books, and more are on their way! You can find paperback copies of Only Ten Cents, Reuben’s Hindrances, What They Couldn’t, and other Pansy novels on Amazon and Barnes and Noble. We’re working on getting even more books published in print format this year, so stay tuned for new announcements. Thanks, Stuart! I have a copy of a pansy book with a handwritten message. I would like to know if it was written by Isabella or someone else. The copy of the book was published in May 1904. The simple inscription is dated Dec. 1906, Rochester, NY. I am just very curious about it. Appreciate any help or thoughts. Wonderful article! I love your blog. I love Isabella books.